Hip Abduction Orthosis provides firm support and stabilization for non operable hip disorders and postoperative, primary or revision total hip arthroplasty. Moisture-wicking neoprene padding. Patent pending "infinite range" hip joint is the only hinge that provides infinite adjustability from -5° to +25° abduction; critical to correct biomechanical fitting. Flexion and extension ROM adjustable, too. Pelvic posterior panel features pivoting adjustment mechanism that eliminates need for male and female versions. Lightweight. Easy on and off. Note: Pelvic and Thigh Components sold separately to accommodate various body types. 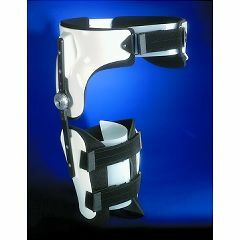 You must purchase Pelvic and Thigh Components and Joint for complete Hip Abduction Orthosis. Sizing: For Pelvic Component; measure waist and hip circ. For Thigh Component; measure proximal and distal thigh circ. Fits male and female. Small: Waist circ. 28" - 32", Hip circ. 32" - 36"
Medium: Waist circ. 32" - 36", Hip circ. 36" - 40"
Large: Waist circ. 36" - 40", Hip circ. 40" - 45"
X-Large: Waist circ. 40" - 46", Hip circ. 44" - 50"
Small: Proximal circ. 17" - 21", Distal circ. 13" - 16"
Medium: Proximal circ. 20" - 24", Distal circ. 15" - 18"
Large: Proximal circ. 23" - 27", Distal circ. 17" - 20"
X-Large: Proximal circ. 26"-30", Distal circ. 19"-22"
Specify size and left or right. I am looking to purchase the hip component, hip joint, extended metal, knee joint and down to ankle..